There’s a reason the microwave oven in your kitchen is a heavy brick: it uses a magnetron and vacuum tube technology that dates back to World War II. But since then, microwave technologies have been vastly improved (see cellphone towers) and a company called Wayv in the UK is finally using them to shrink the microwave oven. 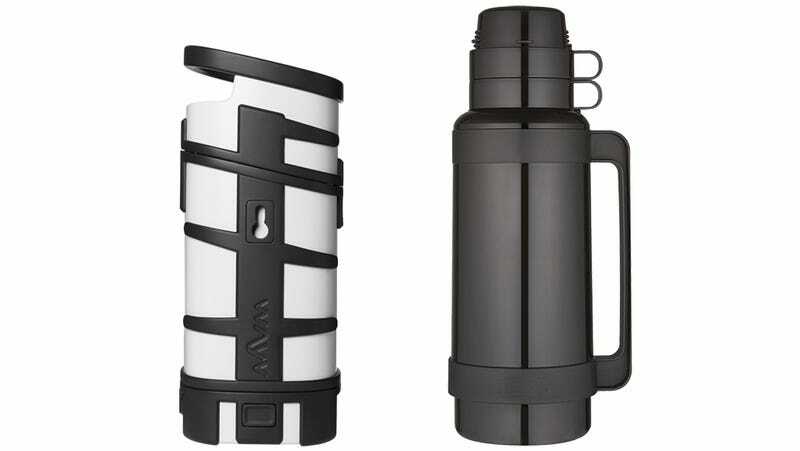 The Adventurer looks like nothing more than a fancy thermos, but it’s actually a fully-functional 200-watt microwave oven that can efficiently heat 500 milliliters of liquids or solids in about four minutes. Its rechargeable battery will keep it running for up to half an hour, which is more than enough time to reheat a bowl of stew at lunch or a jar of baby food while you’re on the road. But it can also be plugged in at home if you simply don’t have the counter space for a full-sized oven. Instead of vacuum tubes or magnetrons, the Adventurer uses laterally diffused metal oxide semiconductors—or LDMOS—transistors to generate heat. Not only are they thin enough to be built right into the Adventurer’s insulated walls, but they’re also light, so the whole device weighs just over two-and-a-half-pounds. And unlike conventional microwave oven technology that can result in hot and cool spots on the inside (that’s why your microwave has a rotating platter) the LDMOS technology evenly and thoroughly heats food without any movement. Wayv is planning to bring the adventurer to the United States next year with a price tag of about $200. It will be targeted at campers, truckers, the military, and anyone who’s had to rely on questionably-safe methods to heat a meal.